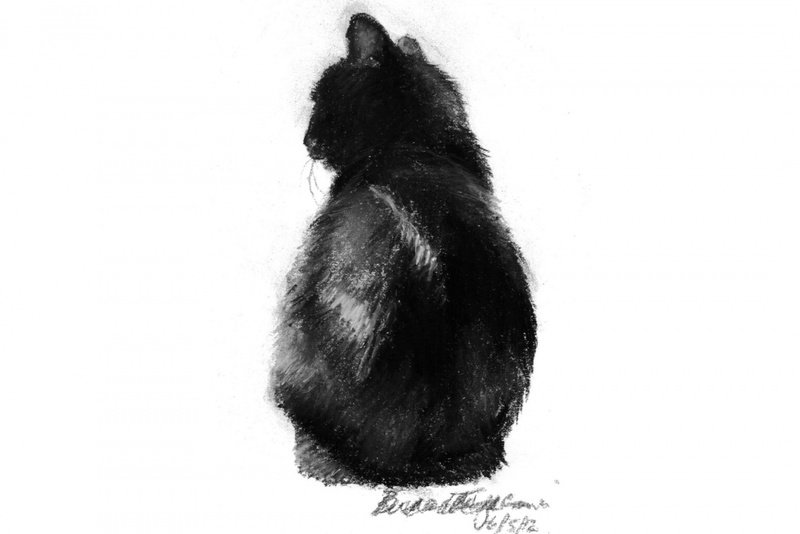 June 5 is the fifth anniversary of creating this simple little monochromatic pastel sketch of Jelly Bean enjoying the view out the window with lots of different kinds of light on his fur. It’s still surprising to me that this has always been one of the most popular of all my daily sketches. At the second anniversary of creating and posting my daily sketches it was the most popular, and today is fourth most popular ever on The Creative Cat. 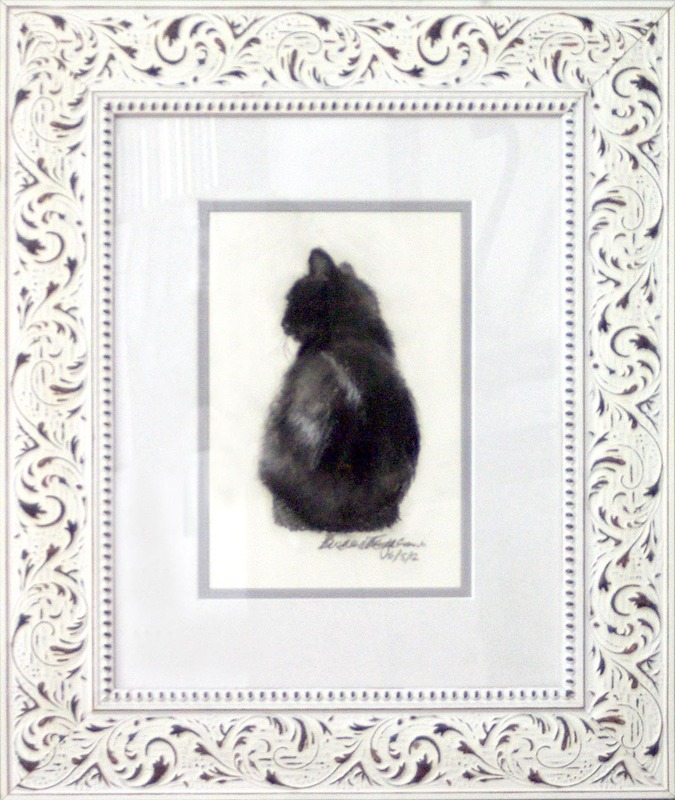 I’ve sold the original to a good friend and lover of house panthers, and shipped digital, giclée and canvas prints all over the United States, into Canada, the UK, Poland, Hong Kong, Japan, and probably a few others I’ve forgotten. It’s a thrill to know little Bean is so easily understood in so many different countries—art and cats transcend spoken language. I love, love, Jelly Bean’s shape. He’s a little plump, but somehow when he sits in certain positions I just want to pick him up he looks so pleasingly rounded. In this case he was simply sitting on the table in front of the window looking out. Very little direct sun was shining on him, but it was shining around him, so he was almost in silhouette in diffuse light with just a few swatches of direct light and a lot of reflected light that highlighted the details on his back and described his shape. My scanner over-scanned this, and I scanned it several times to see if I could change how it came up. All those little white specs are not actually there in my sketch, but they are thin areas in the pastel. When the scanner light shines on something that’s not quite opaque, it will shine right through it depending on its opacity, and so it did here. I find the little dots irritating because I worked hard to work them out of the sketch. But I think the relevant details are still visible. The giclèes are printed on acid-free hot press art paper for a smooth matte finish using archival inks. Giclèe is the highest quality print available because the technique uses a dozen or more ink ports to capture all the nuances of the original painting, including details of the texture, far more sensitive than any other printing medium. Sometimes my giclèes look so much like my originals that even I have a difficult time telling them apart when they are in frames. I don’t keep giclèe prints in stock for most of my works. Usually I have giclèes printed as they are ordered unless I have an exhibit where I’ll be selling a particular print so there is a wait of up to two weeks before receipt of your print to allow for time to print and ship. I offer giclèes of this painting in two different sizes: the full size of 31″ x 23″, a half-size of 16″ x 12.5″. 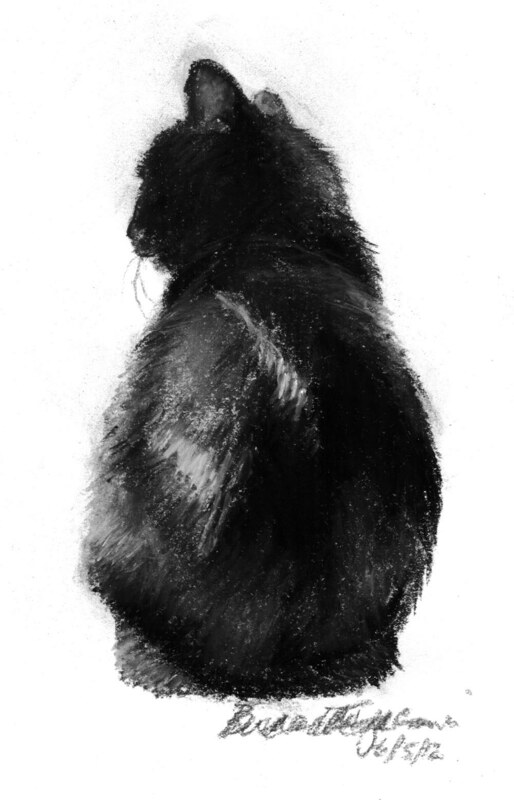 The giclèes have 2″ of white around the outside edges. All are countersigned by me. Digital prints are made on acid-free matte-finish natural white 100# cover using archival digital inks. While digital prints are not the quality of a giclèe in capturing every nuance and detail of color, texture and shading, I am still very pleased with the outcome and usually only I as the artist, could tell where detail and color were not as sharp as the original. Digital prints are only available up to 11″ x 17″ and some of the prints are cropped to fit standard mat and frame sizes.